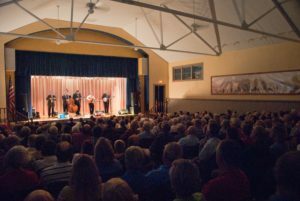 Becky Buller: ‘An Appalachian Evening’ Summer Concert. Becky Buller is an 8-time International Bluegrass Music Association (IBMA) awards winner who made bluegrass music history in 2016 by becoming the first artist ever to win in both instrumental and vocal categories, as well as the first female to win Fiddle Player Of The Year. In 2018, she won the IBMA Gospel Recorded Performance of the Year. Adults $20; Students/K-12 $10; plus tax. . All concerts at 7:30 pm in the air-conditioned Lynn L. Shields Auditorium. Dinner available for purchase in the Schoolhouse Cafe beginning at 6 pm. Featured artist: Melba Cooper.